Updated 4th July:- to include information from Proceedings of the Institute of Civil Engineers – relating to a paper on the Metropolitan and Metropolitan District Railways, 17th February 1885. 22nd February 2010 is an important date in the evolving story of Basilica Fields, this is the day when the world of Artillery Lane was laid before all as an integral part of life in the (amended) history of the East End of London. Some sort of celebration seems to be in order and Adrian has decreed that the occasion be marked in an honourable fashion. So here we present a part of the railway infrastructure for the first section of the Basilica Fields development ‑ a brief outline of Metropolitan Railway track in the period 1895 to 1905 as shall constitute the permanent way of the Inner Circle Extension and the Extended Widened lines in the vicinity of Artillery Lane. This post is unusual by comparison with many of the entries of the Basilica Fields journal in that the content here is either fact or an hypothetical statement for which we continue to seek evidence. There are other categories of the Basilica Fields journal where the reader has to either recognise and separate fact from the writer’s distortion of history (to present a more enjoyable picture of nineteenth century life in the east end of London) ‑ or accept the diary entries as written. Thanks and acknowledgement are due to Leslie Bevis-Smith, HMRS steward for the Metropolitan Railway, for providing information without which the task of building the track would be much more difficult. Where this post provides information as historical fact in regard to “Met” track then the source of that information is Leslie (unless otherwise stated). Unwittingly and without intent, Leslie caused us to take an unexpected diversion in our research into “Met” PW practices, a diversion which has proved to be of inestimable value and yet has caused us to rethink some of the preparatory work for the permanent way of Artillery Lane. A message from Leslie contained an extract from a Board of Trade Accident Report and upon realising that such reports are a source of contemporary information we have been reading similar reports (see the Railways Archive web site). Apart from contributing to our understanding of the permanent way practices of the Metropolitan Railway, several reports have given an insight into the identities of locomotives to be found working the tunnels in the Basilica Fields time period and provided, for some services, details of passenger train formations and the identities of the coaching stock (see posts in the Passenger Services category). Other research sources, which provide “visual” information on “Met” track, are the photographic collections of the London Transport Museum (LTM) and the Railway Archive (RA) which is a small part of the Transport Archive (TA). The RA/TA collection features the work of SWA Newton which one might think of as being biased towards the Great Central (MS&LR as was) – however, the London Extension of the Great Central Railway formed a junction with the Metropolitan Railway at Quainton Road and at West Hampstead. As a consequence of those junctions, there are a number of Newton photographs which feature Metropolitan scenes of circa 1900. These collections are searchable, on-line, resources; however, choose search parameters with care… for example: – using “Metropolitan Railway” on the LTM web site produced almost 600 thumbnails for viewing. Those images which are from the Victorian and Edwardian eras provide much material for late-night sessions of sleeper counting. A pleasant consequence of writing posts for the Basilica Fields journal is that reader’s comments on the content of a post often provide either additional material related to the original content or suggestions for other avenues of research. Such has happened in relation to the infrastructure of the Metropolitan Railway in that a comment from Kit Williams has given pointers to a new research resource in the form of the on-line archive of the Institute of Civil Engineers. The Minutes of Proceedings of the “Civils” has revealed a discussion between the George Owen (engineer for Hounslow and Metropolitan Railway) and Joseph Tomlinson (Engineer and Locomotive Superintendent – Metropolitan Railway) in which those gentlemen review contemporary practices in regard to permanent way. The tracks which enter top-left and exit bottom-right are the property of the Metropolitan Railway; those tracks are used by Extended Circle services of the Metropolitan Railway and passenger / goods services of the Great Western Railway. The tracks which enter bottom-left, pass under the Metropolitan lines, and exit top-right are also the property of the Metropolitan Railway although not used by that company; those tracks are used by Extended Widened Lines services of the Midland Railway, the Great Northern Railway, and railways from south of the River Thames. Although financial contributions were made by the main line companies, the Metropolitan Railway was responsible for the building and maintenance of both these lines and the track work reflects contemporary Metropolitan Railway practice. Bottom right of the map, between Union Street and Fort Street, can be seen the connection from the Extended Circle into the small GWR Depot (known as Gun Street depot and lies adjacent to Gun Street and Union Street). Research into the Minute Books of meetings of the General Managers (held under the auspices of the Metropolitan and Great Western Joint Committee) has revealed that the property and land of Gun Street depot belonged to the GWR, hence that company was responsible for the installation and maintenance of the permanent way within that depot. Much to the chagrin of the GWR, the connection into the depot was made from the up line of the Inner Circle Extension and so the GWR had to pay the Metropolitan Railway to install and to maintain the required PW and S&C fittings together with the necessary signalling (and hence a contribution to the wages of the signalman in the nearby Metropolitan signalbox). The historical record for details of Metropolitan Railway permanent way is poor for the period from the early days of the “Met” to beyond the timescale of Basilica Fields. What is presented here is courtesy of the HMRS company steward. From the early days the track was built with iron rails weighing 62lbs per linear yard, of a “Vignoles” section, and laid on longitudinal sleepers. By 1866 the rails were made of Bessemer steel and weighing 86lbs per linear yard, still “Vignoles” section, and now laid upon transverse sleepers. Bullhead rail supported by chairs was introduced after 1872. Circa 1876, the track at Aldgate was bullhead rail of 86lbs per yard, in 24ft. lengths. The rail was supported in cast iron chairs, weighing 39lbs, and retained with outside keys. The sleepers were of red fir and laid on a 12inch ballast bed. The extension to Willesden Green (1879) had plain track as per Aldgate (1876). The extension to Aylesbury (1892) was as per Willesden and Aldgate with sleepers specified as 9ftx10inx5in, 9 per length. Steel sleepers were used for 5 miles of the extension. The extension line widening of 1901 used 30ft rails (presumably with more than 9 sleepers per rail length). Finchley Road was provided with Manganese steel rail of 95lbs per yard for switch and crossing work. July 1892 ‑ Accident at Farringdon, 87lbs Bullhead rail 24ft, 40lbs cast-iron hairs. Sleepers 8’11”x10”x5” and 12”x6′,’ 9 sleepers to the rail length. (Chairs) fixed with 2 bolts, nut on top as GWR, well ballasted. Of real interest in this report is the reference to sleepers of 8’ 11” length ‑ not 9’ 0”, as most modellers think and most historians believe, for track which was laid before circa 1914. The tax on imported timber appears to have been related to the length of the timber and that there was a breakpoint at 9’ 0”, that is, timber at 8’ 11” incurred a lower import duty than timber at 9’ 0”. The reference to sleepers of 12” x 6” section suggests that the Metropolitan Railway used wider sleepers each side of a rail joint or that the rail joint was supported in a “joint” chair. There is at least one photograph which shows a pre-WW1 Metropolitan passenger train on track which includes a joint chair. Finding a joint chair in photographs of “Met” track work is marginally easier than spotting 12” wide sleepers with ballast up to the top of the sleeper; however, a Topical Press photographer was on hand to photograph some repair work at Aldgate during WW1 and this photograph appears to show the use of 12” wide sleepers on either side of a rail joint. Finally, the HMRS company steward has provided a drawing of a Metropolitan cast-iron chair, dated 1883, which shows that the chair was fixed to the sleeper with two, square-headed, bolts into threaded plates under the sleeper. The bolts were arranged diagonally, bottom left corner and top right corner when viewing the chair from above (with the rail running top to bottom). After almost 130 years we rather felt that seeing an example of this chair was very unlikely…. however, whilst looking for something else (is not that always the way? ), an interesting and relevant photo presented itself. The provenance is correct, the date is reasonable… and there is a good probability that this photograph from the TA shows a chair of the “Met” 1883 pattern. Memories of the Met & GC Joint Line, Clive Foxell, published 2002, ISBN 0 9529184 3 9. Pg. 25 shows “Met Tank” No.34 on a down Harrow service, the location is given as “past Willesden” and the date as pre‑1905. The track under the engine has nine sleepers per rail length and whilst the angle of the photo does not help to estimate the rail length the photograph is probably representative of Metropolitan Railway practice in the period 1890-1900. Metropolitan Railway Rolling Stock, James Snowdon, Wild Swan, published 2001, ISBN 1 874103 66 6. Pg. 18 shows “Met Tank” No.59 on a down Rickmansworth service, the location is thought to be Northwood and the date as circa 1890s. This picture gives a very clear impression of “Met” track with 9 sleepers per rail length (although the angle of the train does not enable confirmation of the expected 24’ rail length). In case you think that all is “tickety‑boo” with the arrangement of plain track panels, let us review the “accepted” wisdom and then step back a bit. From the written record and photographic evidence a picture emerges of the “Met” employing 24’ rails with nine sleepers per length from circa 1876 and 30’ rails with eleven(?) sleepers per length being available from 1901 (at the latest). There is photographic evidence to support the idea of “24’ rails and 9 sleepers per length” as being the standard for Metropolitan Railway plain track on new lines in the period to be represented by Basilica Fields. Given the potential for corrosion from the atmospheric conditions in the tunnels and the wear resulting from the passage of trains then replacement of rails every few years, with replacement of sleepers at a slower rate, is likely to have ensured that the permanent way of the Extended Widened Lines was maintained to contemporary specification. For now, “contemporary specification” means that the track work for the Extended Circle Lines on Artillery Lane shall be a representation of bull-head rail, in two-bolt chairs on 8’ 11” sleepers (10” wide generally and 12” wide on each side of a rail joint), using 9 sleepers per 24’ rail length, with clipped fishplates fastened by four bolts/nuts. As to the ballast, therein lies a problem for although we know that the “Met” included late night paths in the working timetable for “Ballast trains” to/from Aldgate the trains seem to have run at times when photography was not possible, hence the material and riddle size is a mystery at the moment. However, the well known saying “Spanner, works, throw”, attributed to Mr. Murphy (or Mr. Sod, your choice), now comes into play. As well as Victorian and Edwardian photographs showing the “24’ rails and 9 per length” standard for plain track there are a number of photographs from circa 1895-1900, reproduced in Jim Snowdon’s book, which show that the “Met” was particular to plain track of a “24’ rails and 8 per length” arrangement. At this time the balance of evidence falls in favour of 9 sleepers per panel for tunnel lines – and hence for Basilica Fields – with the 8 sleepers per panel probably used on the surface lines. In passing, the Metropolitan Railway acquired, circa 1900, a number of single bolster wagons which, coupled in pairs, were able to carry rails of 45ft. length ‑ a sure indication that the Metropolitan Railway was using, or intended to use, rails of that length (as was, for example, the Great Western Railway). 1 of 12” wide sleeper adjacent to the rail joint. last sleeper from rail end so that chair against end of inner fishplate. Chairs are not tight to fishplates, rather the spacing between the chairs at each side of a joint is similar to the spacing between chairs in the middle of the panel. Sleepers are spread “uniformly” along the rail length although the spacing is “approximate” rather than “accurate”! Now those of you who have got this far may well be thinking “What about the Switch and Crossing practices for the turnouts?” and that is a very good question… a question which has not escaped us. At this time we have not been able to find details of the Metropolitan Railway specifications for turnouts; so, for example:- we do not know the preferred crossing angles; we do not know the preferred switch blade lengths; we do not know how the turnout was “timbered” – so any contributions on this subject shall be welcome. Unfortunately a request for any information by Adrian from the London Underground Railway Society was received with ‘panic’ by the secretary (he had never received an enquiry of that nature in over twenty years), and laughter by the Society’s ‘leading historian’. Until we have sufficient to say on the subject of “Met” turnouts, the next step is to build plain track panels as representations of the Metropolitan Railway standard circa 1895-1905 for Artillery Lane – and that is to be part 2 of this topic. The details of track at Farringdon, circa 1892, quoted above are as provided by the HMRS Company Steward – these details are in conflict with an accident report, here, for an accident at Farringdon Street in January 1892 where C. S. Hutchinson, the inspector on behalf of the Board of Trade, took evidence from William H Gates, responsible for the permanent way of the Metropolitan Railway, that sleepers in that location on the Widened Lines were of 10 feet in length. Accepted wisdom is that sleepers were 9 feet in length until circa WW1 when a change was made to 8 feet and 6 inches. Until further information is forthcoming about this subject then the track for Artillery Lane on both the Extended Circle and Extended Widened Lines is to be with sleepers which are 9 feet in length. The Queen, Limehouse. June 1897. This time last year I’d have expected to have the baseboards built by now and be well on the way to having much of the track down. Neither has happened for the simple reason that I also never expected to spend much of last year, and most of this year thus far, sitting in hospital wards with one of my daughters. With that in mind, I never expected I’d have schedule a post to publish at a future date (this post was written and set for publishing three days in advance) just in case I wasn’t here to do it. At the time of writing this blog has had 12,538 all-time views (2,800 in 2011 already), with December 30th 2010 as the busiest day with 237 views. Search engines bring in a good number of visitors, recurring themes being obvious things like Smithfield, LBSCR, Great Eastern, Sondes, Metropolitan, etc, and referrals come in from a large number of railway and modelling sites and blogs, many of which appear in the sidebar – James Wells’ Eastmoor being the largest referrer of them all. There are also some strange referring sites (for example lindsaylohanblog and petbookreviews…) and some very dubious dating sites referring here too. Blimey. Anyway, this time next year I should have the baseboards built and the track laid. I know that for a fact ‘cos someone else is building the track for me, and they’ll soon be writing a few posts about the trials and tribulations of researching the Permanent Way of the Metropolitan Railway and its widened lines, and the construction of it in ScaleSeven. Anyway, a celebratory photo for the blog’s birthday. 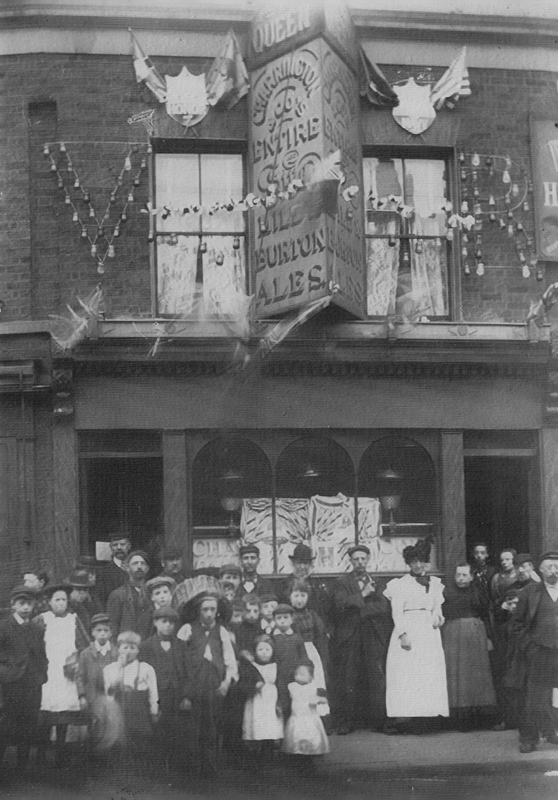 Taken at the Queens beerhouse in Rhodeswell Road, Limehouse, the VR in coloured lamps on the first floor and a date of June 1897 gives the game away: Queen Victoria’s Diamond Jubilee celebrations. Nothing like a good knees’ up in the East End! Part of the big historical background to Basilica Fields has now been uploaded and can be found in the navigation bar above, or by simply clicking here. I sent the original copy over to Mike Bootman for proofreading and comments, and he returned a completely re-written document fleshed out with some fantastic ideas which dovetailed perfectly with both my plans and the real historical record. I’ve only made a couple of small changes to his final draft reflecting updates to the evolution of Basilica Fields in the intervening five months or so since he penned it. History can be re-written! 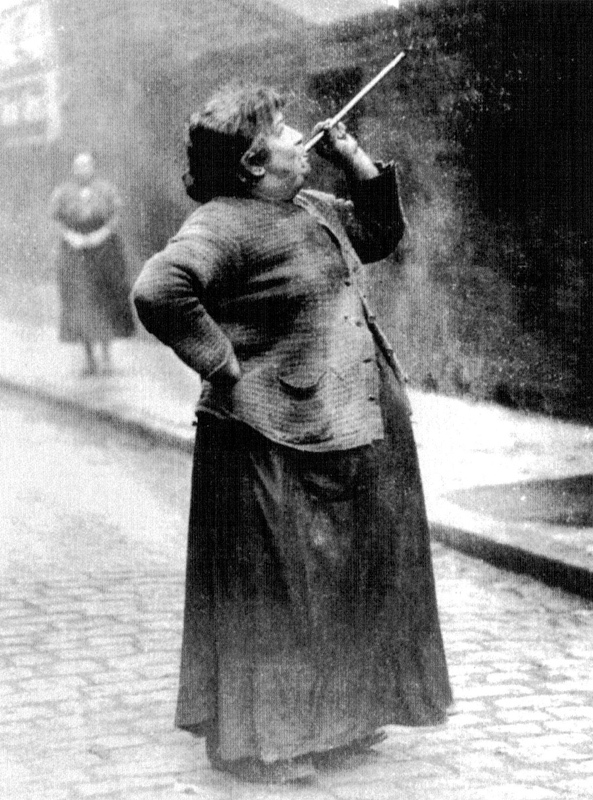 Mary Smith, knocker-up of Limehouse Fields. I’m not one for watching much telly, but having spent a great deal of time in hospital wards and waiting rooms of late, one soon learns that the idiot lantern is the designated panacea to the whiling away of interminable hour after hour. At least on-ward you can switch the bally thing off, read a book or bash merry hell out of the laptop, but in waiting rooms the brain-rot that is Daytime TV is as good as any bottle of valium to send the assembled masses into a comatose state. Beats a cannula any day! Anyway, the point I’m getting to is that a couple of weeks ago, one of those exciting (yawn) house makeover programmes was on where giggly couples buy a house (often a nice Victorian or Edwardian one, replete with oodles of charm and original local features intact) at auction. They then gut it completely (you know he sort of thing: strip out the original cast iron fireplace and replace it with an spaceship-silver Ikea one with white pebbles and a glowing aura ball ‘cos it’s trendy), it and turn the whole shebang into another uPVC double-glazed clone that could be plonked down on suitable foundations almost anywhere in the country. Anyway, and I’m really getting there; in this particular edition one of the auctioned houses was in a mining village in Nottingham or Derby and still had a slate embedded in the brickwork by the front door upon which the miners used to write the time that they needed knocking up to start shift down t’mine (my wife is from the area, so I’m allowed to speak and write in the vernacular). Anyway, and the crux of this story is looming larger now; in the East End, where life for the employed was forever balanced on a knife-edge, where unpunctuality could mean instant dismissal and a speedy spiral for them and their family into poverty, homelessness and destitution, those working unsocial hours, such as the market workers of Limehouse Fields, employed a knocker-up. Mary Smith of Brenton Street (above), was paid sixpence a week per client to shoot dried peas at their bedroom window to get them up in the early hours of the morning.